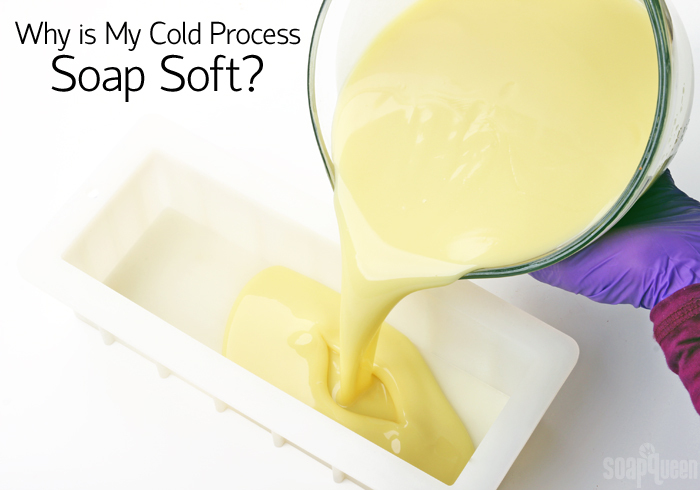 Why is My Cold Process Soap Soft? Cold process soap requires patience. It needs several days to harden in the mold. Then, it needs to cure for 4-6 weeks to allow excess water to evaporate. Curing creates a firmer bar that lasts longer in the shower. All this waiting can be the hardest part of cold process soapmaking! But, what if your soap takes longer than usual to harden? If your soap is still soft to the touch after a week or two, something might be a little off. Soap can take anywhere from 1-15 days to harden in the mold, depending on a variety of factors. Two to three days in the mold is average. There are several factors that determine how long soap needs to harden. The first is the type of oils in your recipe. The more soft oils (such as olive, sweet almond, rice bran, canola, etc.) the soap contains, the softer the bars will be. It may take more time to harden in the mold. The more hard oils the recipe contains (such as palm, coconut, cocoa butter, beeswax, etc. ), the quicker the soap will harden. 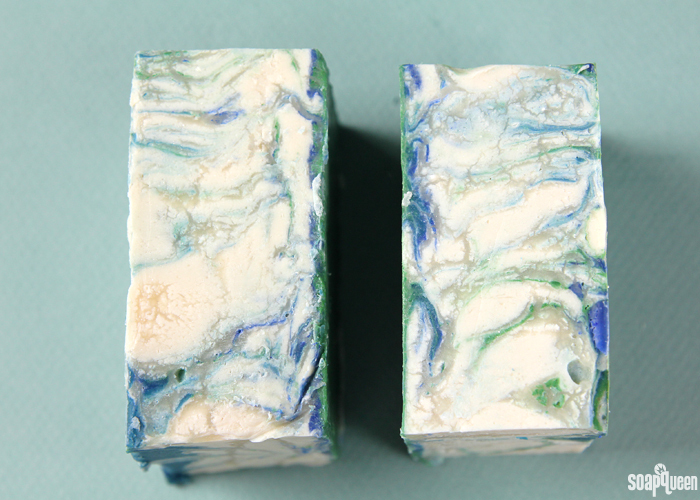 For example, if the soap is made with 100% olive oil, it may take up to two weeks to unmold. But if the soap is 60% hard oils, it could be ready to unmold the next day. 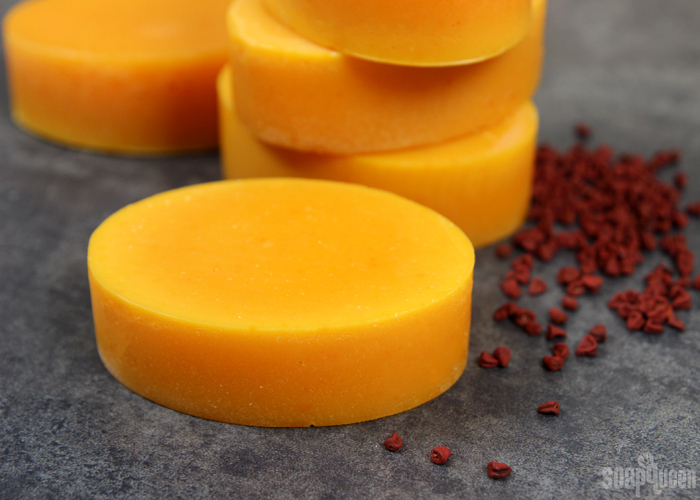 Using more firm oils and butters in your recipe will result in a firmer bar of soap. Another factor is the superfat of the recipe. Oil that’s not turned into soap by the sodium hydroxide lye is called the “superfat.” An average superfat is anywhere from about 1-7%. 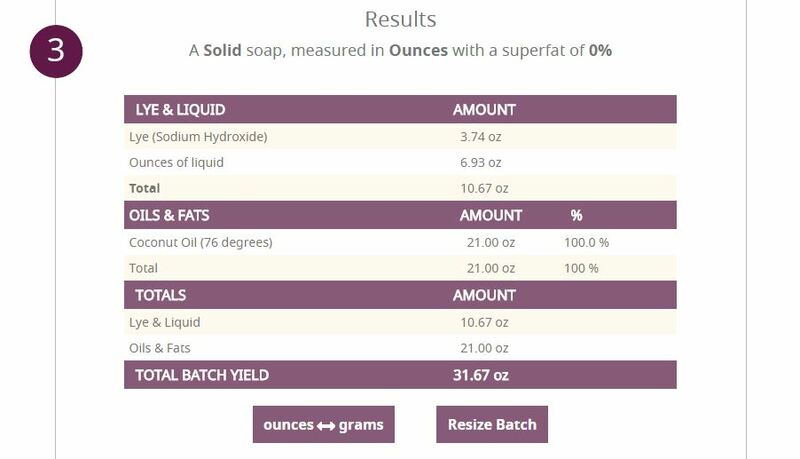 The higher the superfat, the more “free-floating” oils in the soap. The terms “superfat” and “lye discount” can be used interchangeably. This is because in order to create a superfat, you use less lye in the recipe. Extra oil creates a more gentle bar, but it can also make the bar softer. If you used a large superfat (generally 7% or more) and the bar feels soft to the touch after a few weeks, the superfat may be the culprit. Personally, I use a superfat of 5% in most of my cold process recipes. I have found this to be a good balance between a firm bar that’s also gentle on the skin. Speaking of “extra stuff” in your soap, let’s talk additives. Colorants and fragrance oils are the most common “additives” and they can make soap soft if too much is added. Dispersing powdered colorants in lightweight liquid oil is a great way to avoid chunks and streaks of color in the final bar. But, if you add too much dispersed colorant it can soften the bar because you’re adding more oil as well. In fact, you’re technically increasing the superfat! If you calculate your recipe to have a 7% superfat and add lots of dispersed color for example, you may end up with a soft bar. 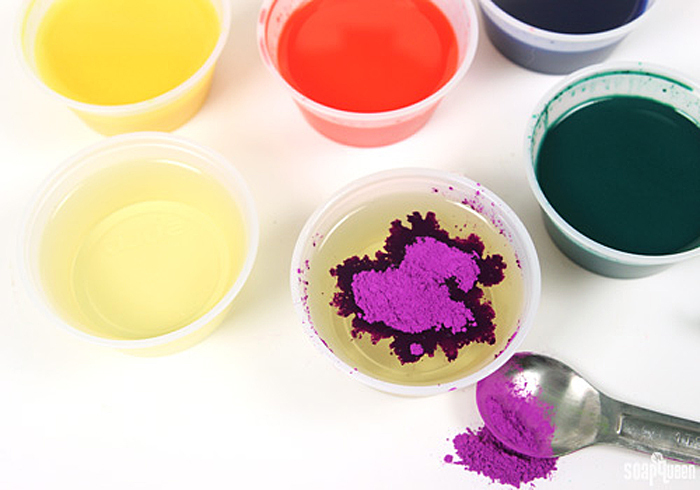 Usually, colorants are dispersed at a rate of 1 teaspoon colorant to 1 tablespoon lightweight liquid oil. If you want to add a lot of colorant, you may want to decrease the amount of oil in your dispersion. 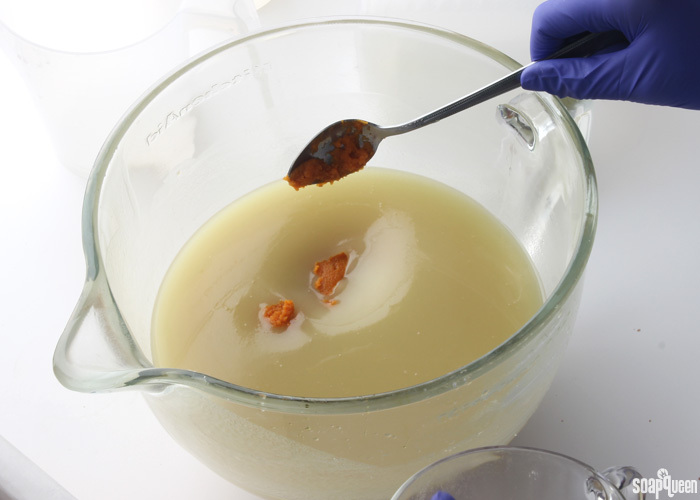 Adding too much extra oil (like with dispersed colorants) can lead to a soft bar of soap. Adding too much fragrance oil can also lead to a soft bar of soap. That’s where the Fragrance Calculator comes in! Simply enter which fragrance oil you’re using, what you’re making and how much. The calculator will give the amount of fragrance oil that’s safe for skin. The amount given by the calculator won’t lead to a soft bar of soap. That’s one of the reasons why it’s so important to measure your fragrance oil by weight; it gives you the most accurate amount of fragrance oil for your project. Adding more fragrance than recommended could lead to a soft bar. Soap might be soft if too much liquid is used. The Bramble Berry Lye Calculator creates recipes with 22% distilled water in the total recipe. Other lye calculators might have a slightly lower or higher percentage. That’s because the amount of water in your recipe can fluctuate, and still be totally fine. Using less water in your recipe is known as water discounting. Water discounting has several benefits including decreasing the chance of glycerin rivers and creating a bar that unmolds faster. Learn more about water discounting soap here. On the other hand, if you use more water than suggested, it takes longer for the soap to become firm. This also applies to adding other liquid additives like milk or purees to your recipe. Too much extra liquid (milk, purees, etc.) on top of the water in the lye solution causes soap to not harden correctly. Water discounting soap reduces the chances of glycerin rivers, shown above. It also produces a bar that hardens faster. The type of mold also affects how quickly soap hardens. In general, cold process soap made in silicone and plastic molds takes longer to harden and umold. This is because silicone and plastic molds create an airtight seal that doesn’t allow for any air to touch the soap. The more airflow, the faster soap hardens. Soap made in wood molds lined with freezer paper has a little more airflow, which helps the soap release faster. In addition, wood molds tend to promote gel phase. If soap goes through gel phase, it becomes harder faster. 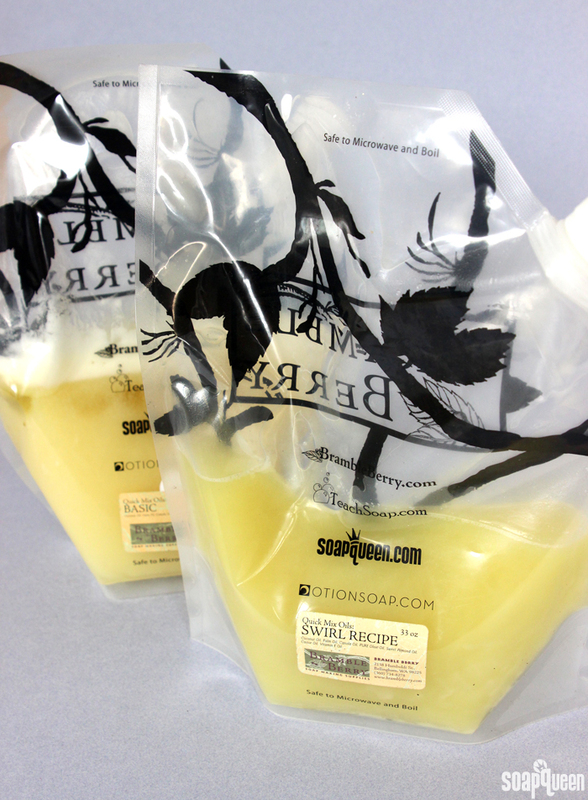 If using a silicone or plastic mold for cold process soap, use sodium lactate. Actually, I recommend using sodium lactate for all your batches! 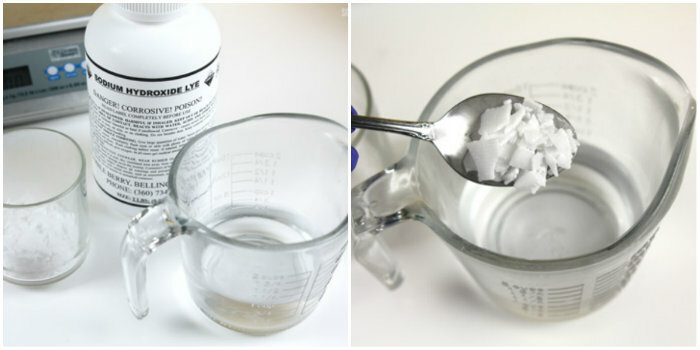 It’s a liquid salt that can be added to cooled lye water at a rate of 1 teaspoon per pound of oils in cold process soap. It’s optional, but I use it in 99.9% of my recipes. It facilitates the hardening of soap, making umolding faster and a longer lasting bar in the shower. For example in the photo below, the soap on the left contains sodium lactate while the bar on the right does not. The bar without sodium lactate was softer, and did not unmold as cleanly. Click here to learn more about sodium lactate. The bar on the left contained sodium lactate, while the bar on the right did not. So, what can you do about a soft bar of soap? The good thing about soft soap is that it’s very rarely lye heavy! 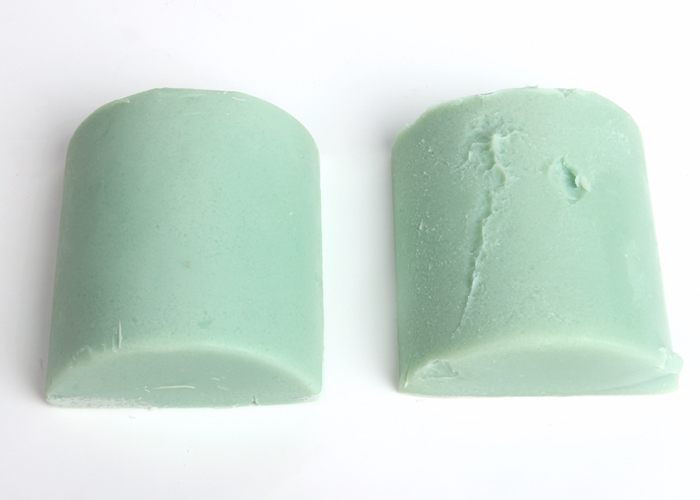 Lye heavy soap usually has the opposite problem; it’s extremely hard, brittle and crumbly. If your soap is too soft, chances are you added too much of something…but not lye. It’s usually too much oil, fragrance, liquid or other additive. The bad news about soap that’s too soft? It’s a little tricky to fix. The only real option is to rebatch the soap. To help firm it up, you can add shreds of a firm bar. This helps balance it out. Learn more about rebatching soap here. 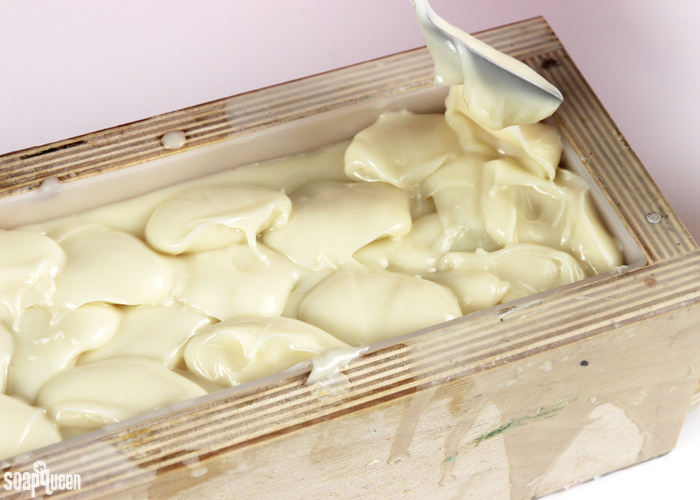 What can you do if you want to ensure your soap unmolds within about 2-3 days? Check out my tips below. Use at least 40% hard oils in your recipe. These include coconut oil, palm oil, cocoa butter, etc. 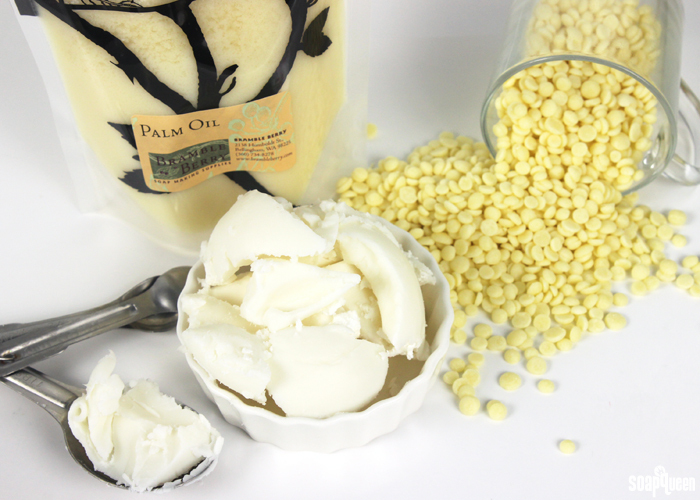 This post has a list of common soaping oils, with general recommended usage rates to aid in formulating your recipes. Stearic acid at 0.5% of your oils can be used as a hardening agent in cold process soap. It does speed up trace, so keep that in mind! Sodium lactate is your friend! Because I like to unmold my soap within about 2 days, I use sodium lactate all my batches. It’s a liquid salt that’s added to cooled lye water. It helps the soap harden more quickly, which helps it release cleanly from the mold. If I use sodium lactate, I can sometimes unmold my soap the next day. Water discount your soap anywhere from 5-20%. Just keep in mind the more you water discount your recipe, the faster your soap will accelerate. Generally, I don’t water discount more than 15% unless I’m in a huge hurry to unmold. If you’re adding ingredients like purees, I recommend water discounting to take the extra water in the puree into consideration. Check out this post for more info. Decrease the superfat. The more extra oil you have in your soap, the softer it will be. I have found 5% to be a good balance between firmness, and a skin-loving bar. Promote gel phase. When soap goes through gel phase, it speeds up the saponification process. This results in a bar that is firmer more quickly. Thicken the trace of your soap. Soap that is poured into the mold at a thin trace will need more time in the mold than thick traced soap. 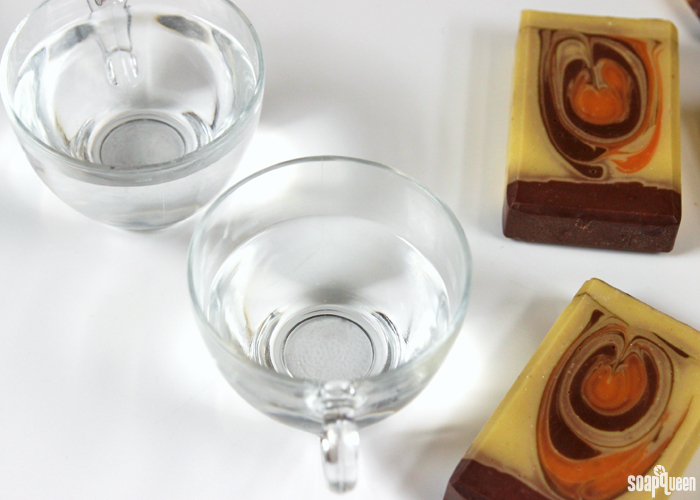 Using an accelerating fragrance oil helps your soap harden in the mold faster. How long do you usually wait to unmold your soap? In general I always recommend 2-3 days, but sometimes you can get away with unmolding the next day if you use some of the tips above! Creating custom oil combinations is one of my favorite aspects of creating cold process soap. Each soapmaking oil contributes something a little bit different to the recipe. For example, palm oil makes a firmer bar of soap, while coconut oil creates a more cleansing bar. It can take a little trial and error to find the perfect recipe for you. After years of soaping, I have developed a few go-to recipes that produce consistent results. These go-to recipes were the inspiration for Bramble Berry’s Quick Mixes. 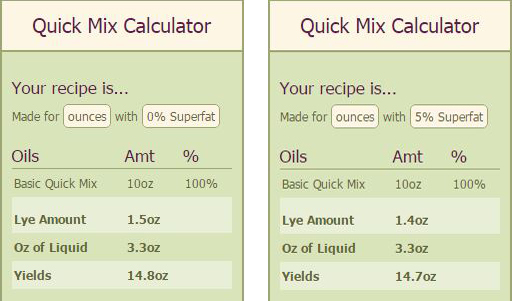 The Quick Mixes are pre-measured cold process oils that you can heat up, measure and use! They save time because you don’t have to weigh and blend oils, and they work great for both cold and hot process recipes. There are three different varieties of Quick Mixes, each designed to produce a slightly different bar of soap. Read more about each kind of Quick Mix below. 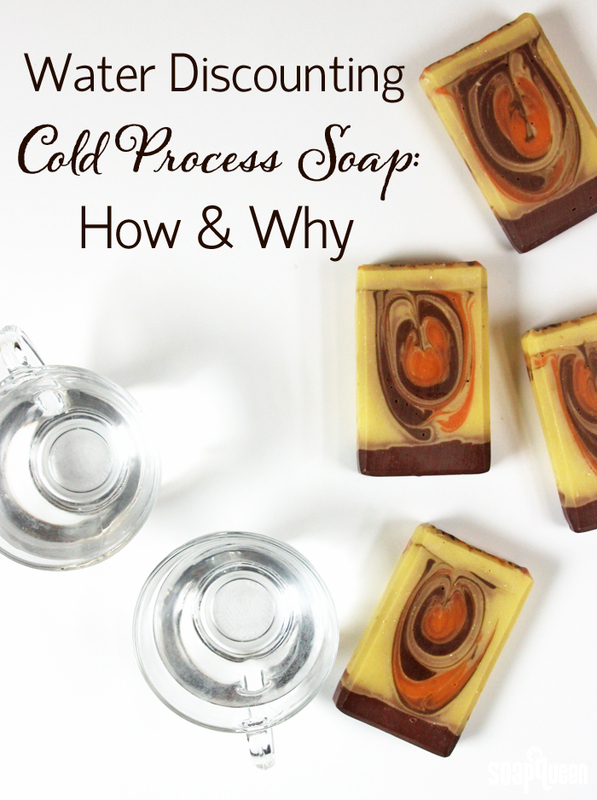 Making cold process soap successfully requires precise measurements of lye and oil. If too much lye is used the soap will be lye heavy, which can irritate or even burn the skin. Lye heavy soap will have a higher pH than perfectly balanced cold process soap. 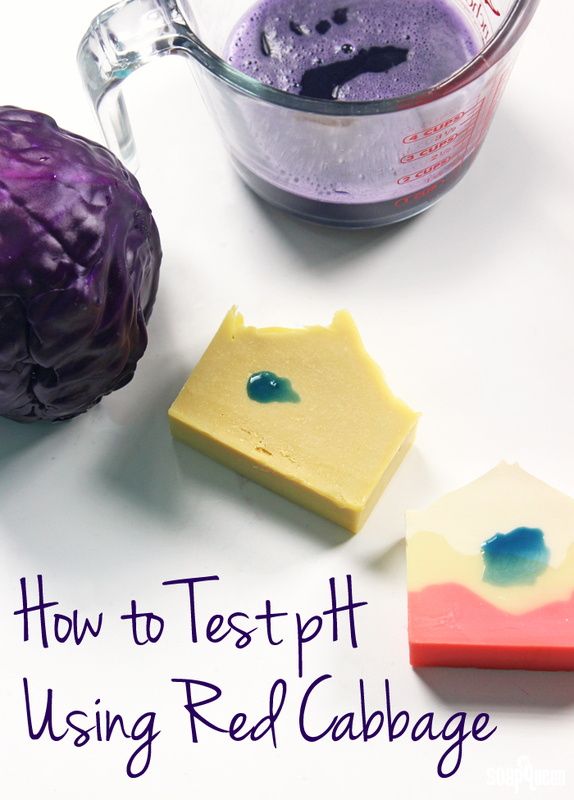 If you are worried that your soap is lye heavy, there are several techniques to test the pH and discover if it is safe to use on the skin. One of which includes using something you may already have in your fridge…red cabbage! What is pH and what does it have to do with soap? The pH scale measures how acidic or basic a substance is. The scale ranges from 0 to 14. A pH level of 7 is considered neutral. A pH higher than 7 is considered basic or alkaline, and pH level of below 7 is acidic. Cold process soap is naturally alkaline with a pH of around 9-10. This pH helps to gently clean the skin. 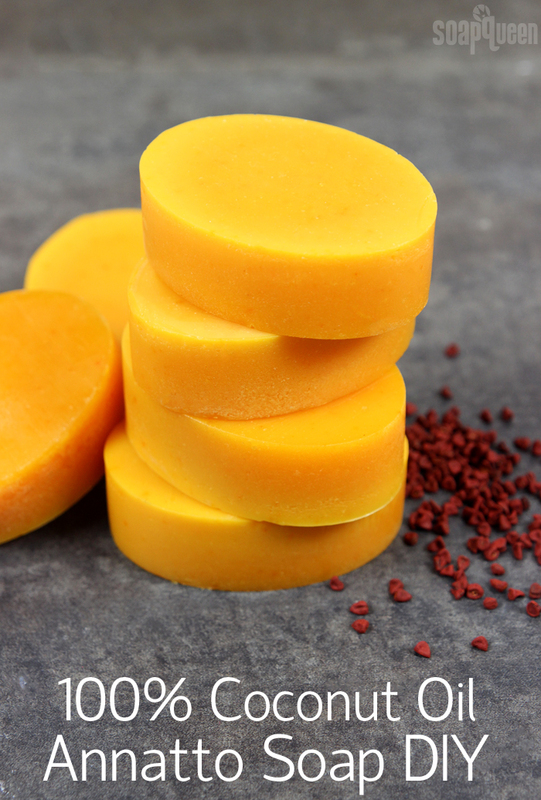 Dreaded Orange Spots, also known as DOS, is something many cold process soap makers have unfortunately experienced. 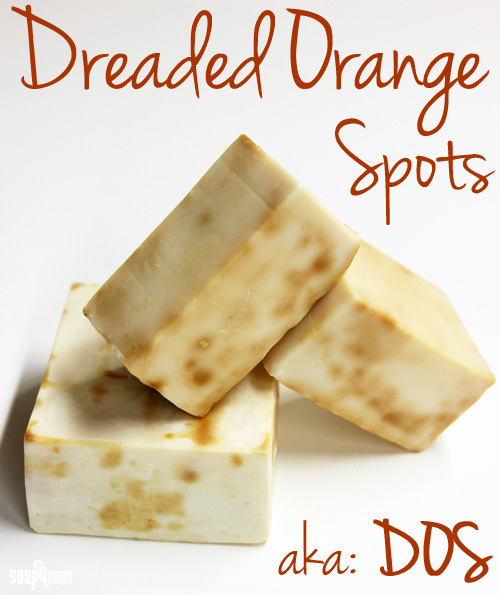 Dreaded orange spots are exactly what they sound like…orange spots on your soap! The most common cause of DOS is rancid oils, but there are several factors that can contribute to dreaded orange spots. 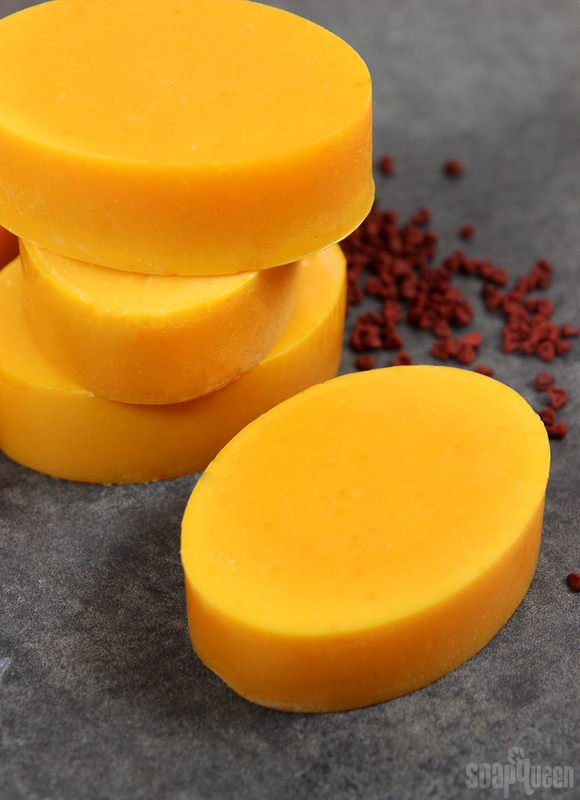 Dreaded orange spots can appear on cold process soap while curing, or months after it has been made. The appearance of DOS can range from a light orange to a deep rust color. DOS may appear in various sizes and places on the soap. Some bars may develop only one spot, while some bars become completely covered. Soap with dreaded orange spots is safe to use, but it is a cosmetic issue and may develop an unpleasant odor. I wasn’t sure going into this how much I would comprehend. I understand the reaction of Saponification on a very basic level. 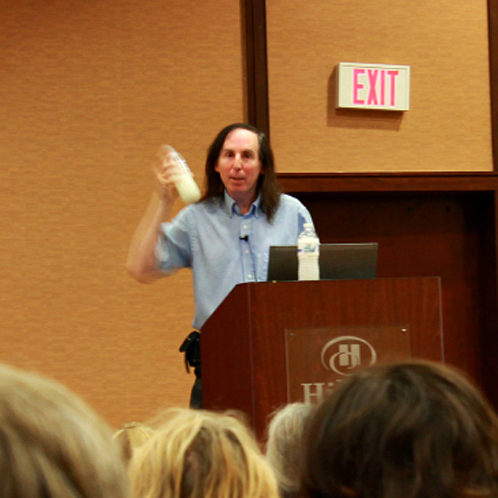 I was familiar with Kevin Dunn as he is of some “fame” in the soapmaking world, so of course I wanted to hear him speak.